1. Preheat the oven to 170°C, gas mark 3. Mix the crushed biscuits with the melted butter and press into the base of a 20cm greased and base-lined spring release tin. Arrange two-thirds of the raspberries over the biscuit base. 2. Place the cream and chocolate together in a small pan, and heat gently until melted, then cool. Beat together the soft cheese, sugar and lemon zest, until smooth, then add the egg yolks and beat well. Stir in the cooled cream and chocolate mixture. Spoon into the tin and level the surface. 3. Bake for 40-45 minutes until only just set. The top should wobble gently. Remove from the oven and leave to cool in the tin. Chill for at least 2 hours, or preferably overnight to let the centre set. 4. 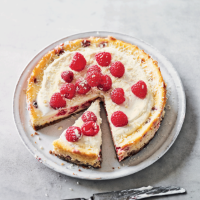 To serve, remove the cheesecake from the tin and place on a serving plate. Spread the soured cream over the surface, top with the remaining raspberries and scatter with shaved white chocolate curls.